PALO ALTO, CA--(Marketwire - October 20, 2010) - Yummly, the company that is pioneering semantic search for food and recipes, wants you to cultivate your inner kitchen witch this Halloween. The company announced today that it has expanded its taste-specific recipe search platform to make finding and customizing recipes for Halloween and other upcoming holidays a snap. 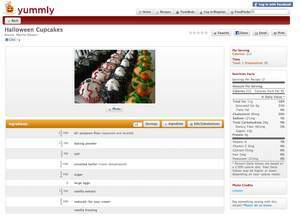 Yummly's easy-to-use search interface -- the FoodFinder -- lets you find Halloween recipes by your tastes and dietary preferences, as well as those of your little ghosts and goblins. Yummly aims to make Halloween a little less frightening for health-conscious and sugar-savvy consumers this year. Prefer your pumpkin bread and jack-o'-lantern cookies dairy-free or your candied apples flavored with agave nectar? Yummly's intuitive recipe platform makes it simple to search by ingredient, diet, or find healthful substitutions based on you and your family's tastes. Nutritional stats -- like calories, fat content, sugar content and more -- update automatically when you make ingredient substitutions, allowing registered users to decide which healthy tricks work best for their treats. If you prefer your treats fully leaded, Yummly has plenty of fun and unique recipes for you too, like Halloween Pie and cupcakes that use traditional ingredients for Halloween confections and party punches that are sure to please even the finickiest of sweet tooths. In just a few clicks of your mouse, Yummly instinctively adjusts search results to match anyone's tastes or quibbles and takes the scream out of planning your Halloween party menu. To find more Halloween tricks and treats and get your own taste-specific party started, sign up for a free Yummly account at: www.yummly.com. Founded in 2009 by foodies on a mission to invent a better way to find, modify, share and store recipes, Yummly.com is the world's first semantic search platform for food and a premier destination for cooking enthusiasts of all skill levels. Empowering individuals to discover recipes based on their personal tastes and preferences, Yummly offers more than 500,000 of the most popular recipes aggregated from leading cooking sites and all over the web. Find out what's cooking at Yummly: visit the Yummly blog blog.yummly.com, connect on Facebook www.facebook.com/yummly, or follow on Twitter www.twitter.com/yummly. Yummly, FoodFinder and TasteBuds are trademarks of Yummly Inc. and may be registered in some jurisdictions. All other trade names or trademarks used herein are recognized to be the property of their respective owners. All rights reserved. About this company Yummly Inc.